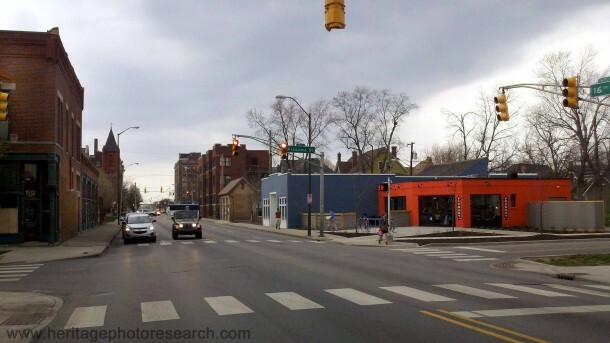 Sixteenth Street, at one time a dirt road known as Tinker (and later 7th) Street, is undergoing revitalization and promises to once again become a commercial corridor for the two neighborhoods that it borders: Herron-Morton Place and the Old Northside. As Indianapolis strives to become a walkable city, it is interesting to note all of the services and stores once located in the 200 block of East 16th Street just a short stroll from residential areas. 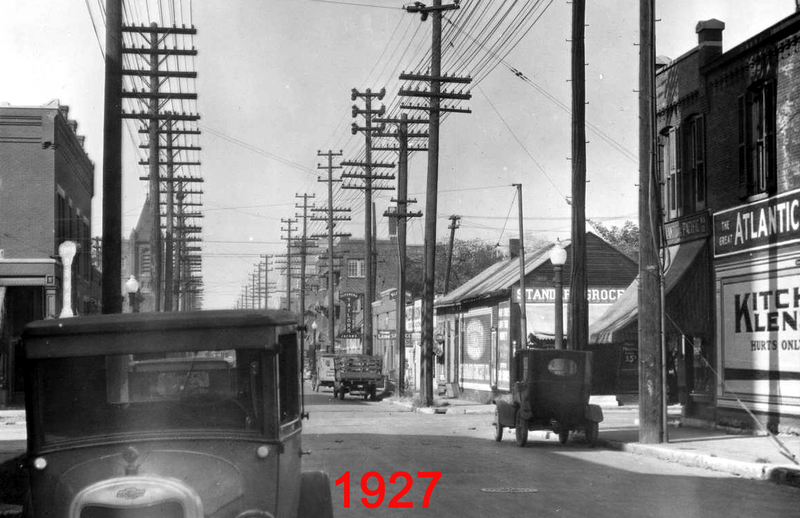 Electric poles dominate East 16th Street in this 1927 view made by the Indianapolis Power and Light Company (IPL). 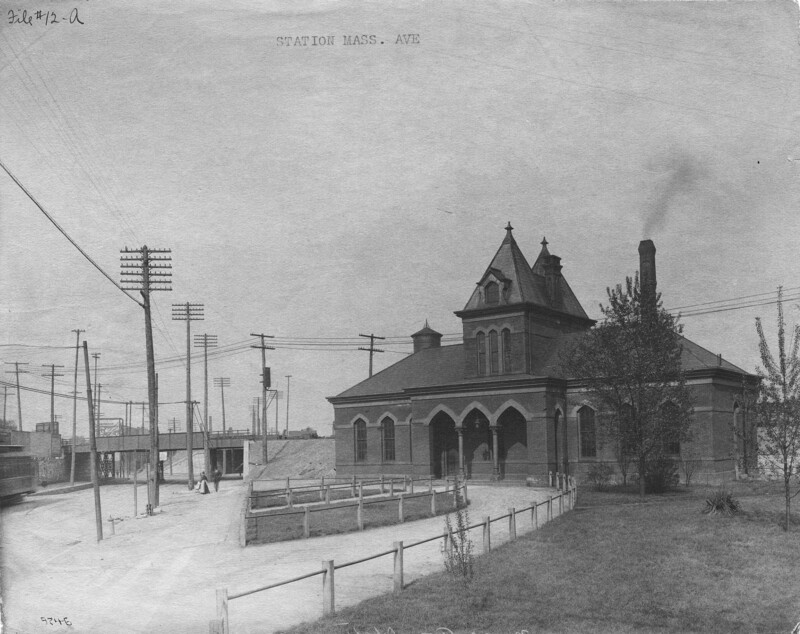 The photographer faced west and captured the intersection of North Alabama Street. Shown on the left (south) in what is now the Old Northside Neighborhood is a two-story brick drugstore then owned by Alf R. Thomas, and several one-story brick structures occupied by Bailey and Hackleman radios, a poultry store, a potato chip shop, Harry Hume’s grocery, the Wawasee Pastry Shop, Benjamin Prather’s restaurant, a barber, and a dry goods store. In the distance is the spire of the First Congregational Church. Not visible on the corner of 16th and Delaware is the First Presbyterian Church, constructed in 1901 and now home to Redeemer Presbyterian Church and the Harrison Center for the Arts. 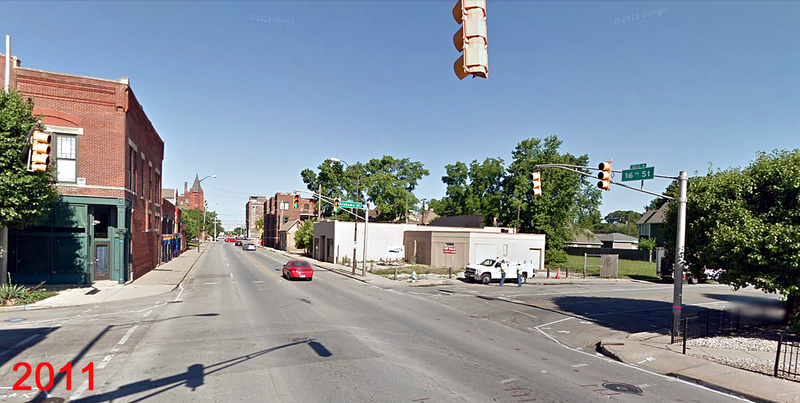 The north side of East 16th Street (currently the southern border of Herron-Morton Place Neighborhood) contained the Walsingham Apartments (the three-story brick building to the far left on the corner of 16th and Delaware Streets); Meyer Jacobs Cleaners and Tailors (located there until the 1970s), Sing Lee Chinese Laundry, Anna Barricklow’s restaurant, Walter F. Jenkins upholstery shop, and Wiles and Wilson’s automobile garage. For a couple of years in the early 1920s, the garage was occupied by Alena Steam Products Company, manufacturers of steam engines with dreams of making steam cars, trucks, and tractors (the company only manufactured two cars before closing shop in 1923). 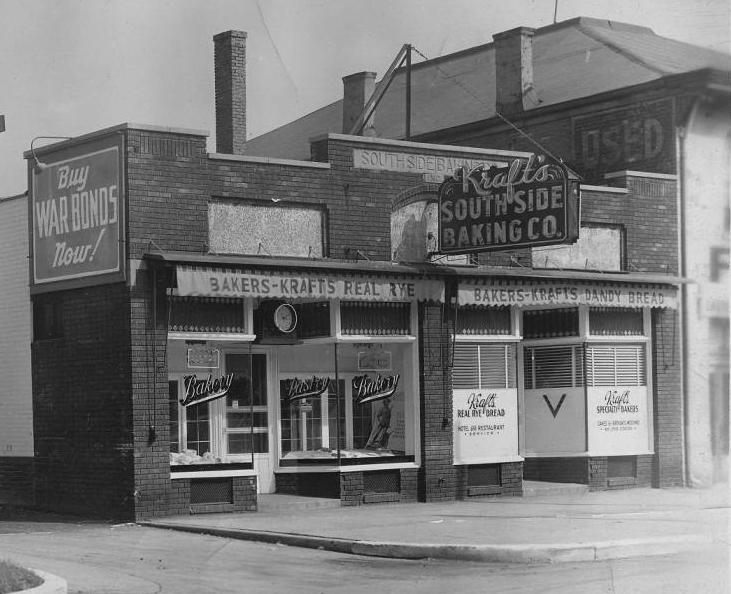 The older frame store on the northeast corner of East 16th and Alabama Streets housed a Standard Grocery and a lunch counter. Eight years later IPL’s photographer returned to document the removal of the overbearing poles and wires. 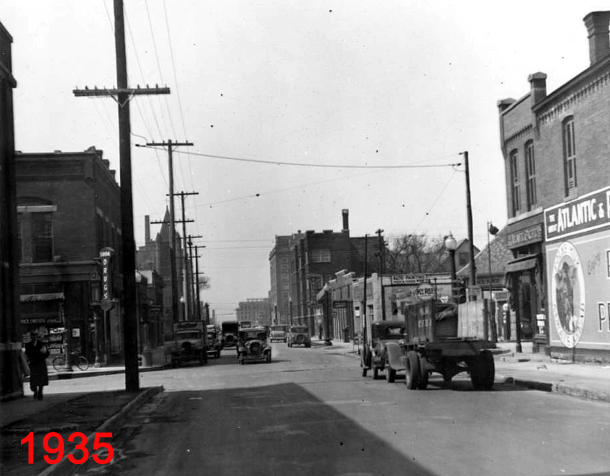 By 1935 the corner drug store on the left was operated by Benjamin C. Harbison. The Great Atlantic & Pacific store (later known as A&P Grocery) on the right now featured a painted billboard advertising Polk’s Milk. 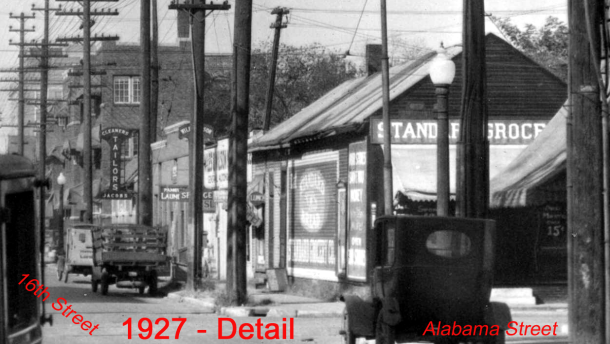 In this close-up view of the north side of 16th at Alabama, it’s evident that the old frame Standard Grocery building had been razed and replaced with a Hy Red filling station owned by Mid Western Petroleum Corporation. Adjacent to the station was Patterson Brothers’ Body Shop and Auto Painting. In 1935 the Chinese laundry was listed as Sung Lee Laundry. By 2011, the old A&P Grocery was long gone and the today the land serves as a parking lot for Redeemer Presbyterian Church, the Harrison Center, and Greg’s (a gay bar and nightclub located on the south side of the street). The old drug store now serves as offices and banquet space for Greg’s with an upstairs apartment. The church spire still stands in the distance and now houses the Joy of All Who Sorrow Orthodox Church. After serving many purposes through the years, Herron School of Art bought the old body shop, Chinese laundry, and gas station and converted them into a sculpture foundry. After the foundry moved in the 1990s, the buildings sat empty for many years until IUPUI sold the compound to the Herron-Morton Place Foundation. Although the laundry building collapsed, the Foundation raised funds to stabilize the old foundry and, after six years of seeking an ideal tenant to serve the needs of the neighborhood, sold the structures to brothers Mark and Josh Nottingham. Today the brightly painted structures hold offices for Nottingham Realty Group (in the blue building) and a coffee shop named Foundry Provisions, much to the pleasure of hundreds of former Herron sculpture students. 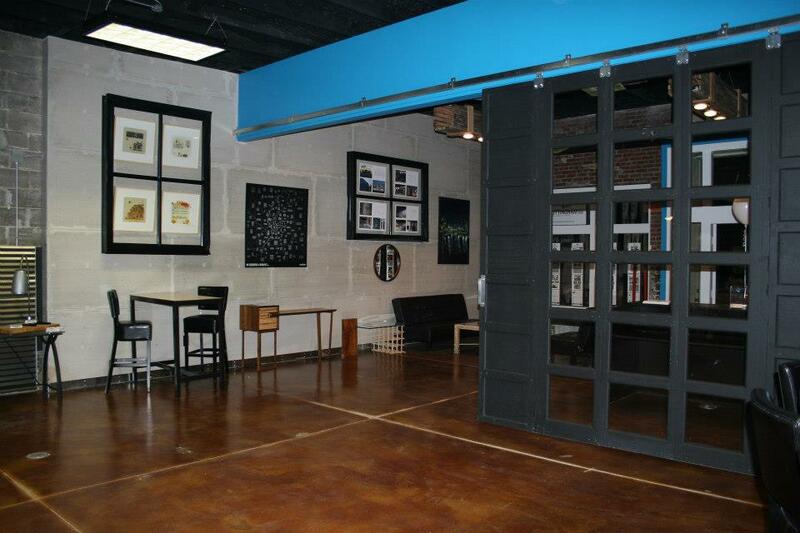 Nottingham Realty Group, specializing in residential real estate, moved into the rehabbed old garage and radiator shop in 2012. Designers retained the industrial look and incorporated original architectural features such as a garage door divider and window frame display boards. 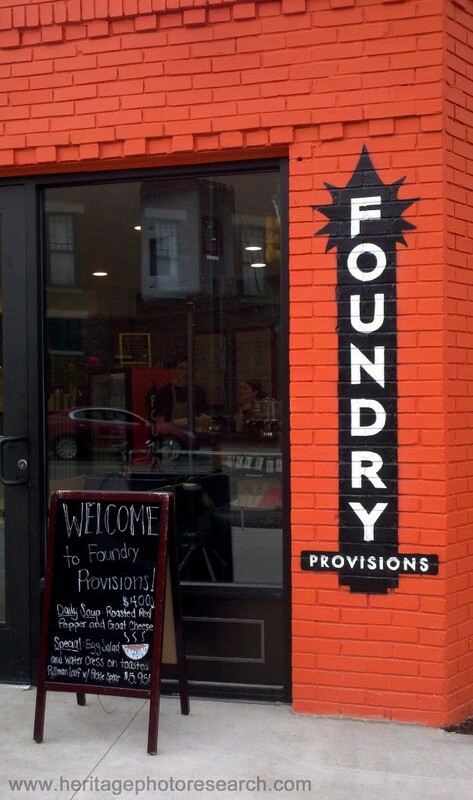 Foundry Provisions formally opened to the public last weekend. To refer to the place as just a coffee shop is not doing it justice since they offer unique sandwiches and paninis, daily soup, excellent fruit smoothies, and baked goods. 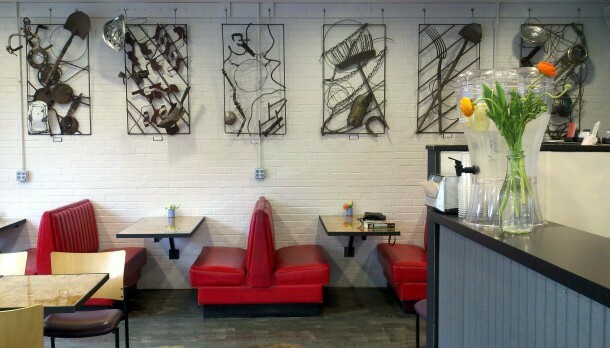 Paying homage to the former tenant, the first of the monthly rotating art displays features the found-item assemblages of sculptor Todd Bracik, who took classes at the foundry while a student at Herron. What other buildings and blocks would you like to see featured? Please share your old photographs via our contact form. The Hubba Hut Grill at 1610 N. Alabama St, Indianapolis, IN……..The greasy spoon restaurant …..was my Great Grandparents restaurant!!! Charlie and Pearlie Mae Barker Gilliam/Gillam. 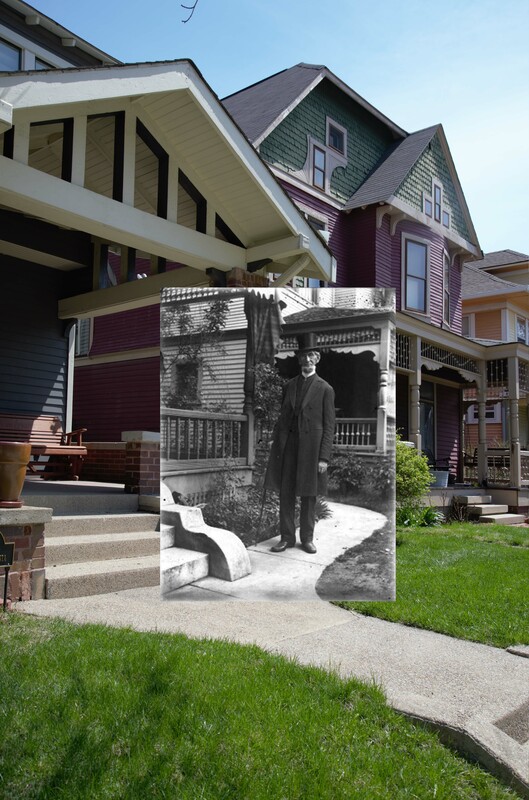 They also lived and ran a boarding house at 1452 N Alabama St, Indpls, IN 46201. There young daughter Audrey Alice Gillam Mathews Gillam lived there until her passing in. March 2005. I was in charge of the estate or funeral. I just drove by the Foundry restaurant yesterday, and was intrigued by the name and what I could see of the interior. I’ll put that on my “must try soon” list.